Not my circus. Not my monkeys. Is been 10 days since the O. vulgaris eggs have hatched. The paralarvae were divided into three tanks, 2 pseudo kreisels (one with a light barrier, one without) and into the octopus display tank with just air bubbles for water motion. The female is still alive and tending several stalks of eggs that failed to hatch. Interestingly, the best paralarve surrival has been in the display tank – the complete opposite of what I expected. It could be that since this tank was long established that the paralarvae had better food choices, or it could be that the flow in the pseudo kreisel made the paralarvae work very hard, or it could be something else entirely. The hatchlings in the pseudo kriesel that were exposed to 24 hours of light are doing much better over all than the ones kept in the dark. What I didn’t know was that they did the same behavior, minus the lightshow, right out of the egg. Here is the video from a previous blog showing what I mean. The 20 eggs we have have almost all hatched and I have started to see the color changing abilities start to ramp up. I hope to have more video next week as the little cuttles get bigger and I am less scared of losing them. What Would Inky Think: Is It OK to Cage an Octopus? National Geographic Magazine – What’s Odd About That Octopus? It’s Mating Beak to Beak. Penn’s Sunday School – Who Is More Libertarian, Glenn Beck or a Colossal Squid? Commensal fish and Mimic Octopus? Science in action! 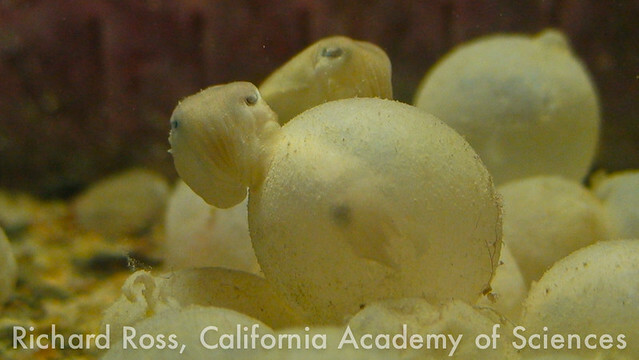 A video update of some cephalopods at the California Academy of Sciences including: hunting Coconut Octopus, mating Dwarf Cuttlefish, hunting hatchling Flamboyant Cuttlefish and feeding Broadclub cuttlefish.